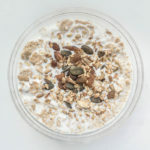 A healthy, easy to digest make-ahead simple breakfast that ticks all the nutrition boxes and is super quick to prepare will keep you going all morning. This recipe is for 2 servings as it will keep well in the fridge for a few days so if you make up a batch on a Sunday night you’ll have your breakfast covered for the start of your working week. The variations are endless. You could also make a grain-free ‘paleo’ version by using extra nuts, seeds and coconut flakes instead of the oats. Mix all the dry ingredients and frozen berries together in a bowl. Pour over the liquid - stir, cover and leave to soak overnight. In the morning if the mixture is a little thick you may need to add a little more water or milk before serving. Top with a dollop of yoghurt.